Alexandria Ocasio-Cortez, the star Democratic congresswoman-elect from New York, compared migrant caravan members to Jewish families fleeing Nazi Germany and other targets of genocide. Congresswoman-elect Alexandria Ocasio-Cortez argued that just as the Jews sought refuge from Nazi Germany, members of the migrant caravan have every right to ask for asylum in the United States. Her comment sparked both applause and outrage in response to her Twitter post. The self-described “democratic socialist” expressed her outrage over a Sunday altercation on the US-Mexico border, in which US border patrol agents used tear gas to disperse hundreds of caravan migrants who tried to force their way into the United States by overthrowing border patrol agents by throwing rocks and bottles. 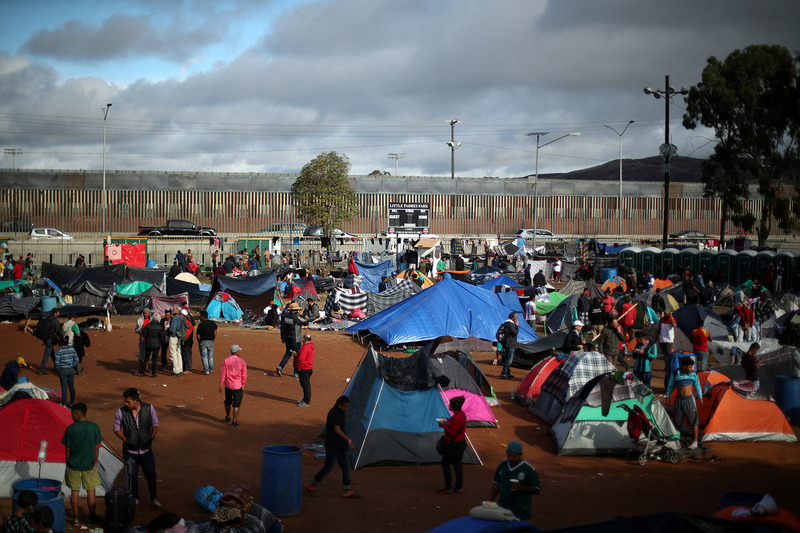 The San Ysidro crossing, a busy entry port between Tijuana and San Diego, was temporarily closed following the clashes, and several dozen migrants were arrested on the US side of the border. Ocasio-Cortez, who became the youngest woman elected to Congress after triumphing in November’s midterm elections, has emerged as a leading progressive voice – but her critics have accused her of being ill-informed. While some applauded her, the soon-to-be congresswoman was quickly swamped by angry tweets calling her comment ridiculous and offensive. 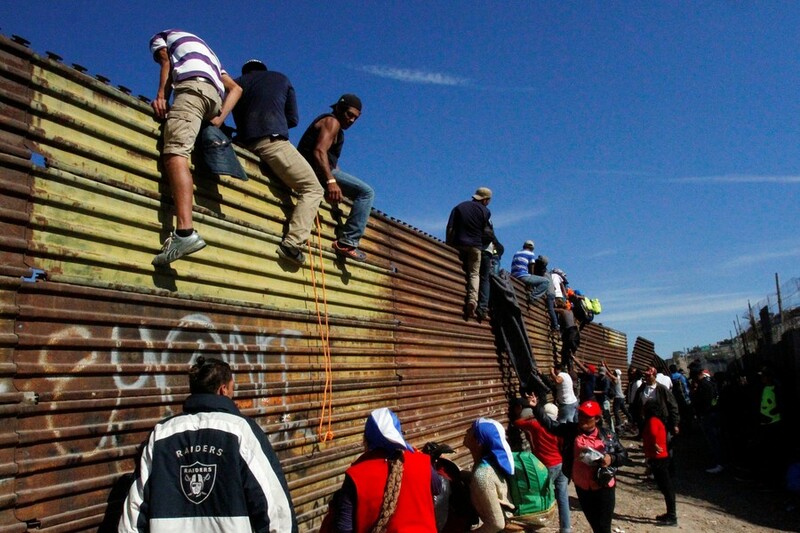 “Peope where (sic) rushing the border today and throwing rocks. Border Patrol pushed back. Ocasio compared the rushers to Jews fleeing Europe. I said it is not the same on merit (no pre-Holocaust now in S. America) and my grandparents did not border-rush despite suffering. Case closed,” one blue-check-marked commenter wrote. The Daily Caller’s Benny Johnson also scoffed at the comment, arguing that it was an absurd comparison. America accepting a Jewish refugee from Germany – who was fleeing the systemic state-sponsored mass slaughter of their people that killed +6 million Jews from 1934-1944 – is the moral equivalent of America accepting economic migrants in the caravan today. Even some of her defenders noted that perhaps it wasn’t the best comparison – since the United States was not as welcoming as it should have been to those fleeing Hitler’s Germany. True but the US wasn’t very generous about letting Jews fleeing Hitler in. In fact we turned them away. But they weren’t regarded as criminals. More than 7,000 migrants from Central America are currently stranded on the border between Mexico and the US. President Donald Trump has resisted calls to allow the migrants to enter the country, and has even threatened to “permanently” close the border in order to keep the caravan – which he claims consists of numerous “stone cold criminals” – out. During a press conference last week, Mayor Juan Manuel Gastelum asked international groups like the United Nations to step in help the city deal with the influx of migrants, amid a lagging response from the Mexican federal government, which he accused of neglecting their responsibilities to deal with migrant and immigration issues, AZ Central reported. Sen. Lindsey Graham (R-SC) tweeted at Representative-elect Alexandria Ocasio-Cortez (D-NY) that she should visit the U.S. Holocaust Museum to educate herself about the differences between Jewish refugees from Nazi Germany and the migrant caravan trying to cross the U.S.-Mexico border. On Sunday, Ocasio-Cortez had tweeted that the migrants — whom she prefers to call “asylum-seekers,” though few would qualify — should receive the same consideration that Jewish refugees from Nazi Germany received during the Holocaust. Ocasio-Cortez appeared not to understand that the U.S., under Democratic President Franklin Delano Roosevelt, infamously turned Jewish refugees away. What did actually happen to Jewish refugees from Germany and Austria? The U.S. maintained its strict controls on the number of migrants it would accept in those years up to entry into the war in 1941. There was also no difference made between simple migrants and refugees. Thus, with strict numerical controls on who could come, many couldn’t and thereby perished. Actually, it was worse than this. One shipload on a ship named the St. Louis actually arrived but were sent back to Europe. Those who went back to mainland Europe then largely did die in the Holocaust. The U.S. took no part in the Kindertransport that saved tens of thousands of children (one of the finest TV clips you’ll ever see is on this subject) to the shame of the administration of the time, that of the great liberal President Franklin Roosevelt. It’s thought this resulted in 20,000 extra deaths. Not knowing all this shows Ocasio-Cortez’s knowledge of history. Of course, after all of these events, we all had a look around the world and decided that we ought to do it differently. Which we do today, as apparently Ocasio-Cortez doesn’t know. Ocasio-Cortez never explained what “violence” the migrants in the caravan were fleeing that would compare to the genocide of Jews in Europe under Nazi Germany.